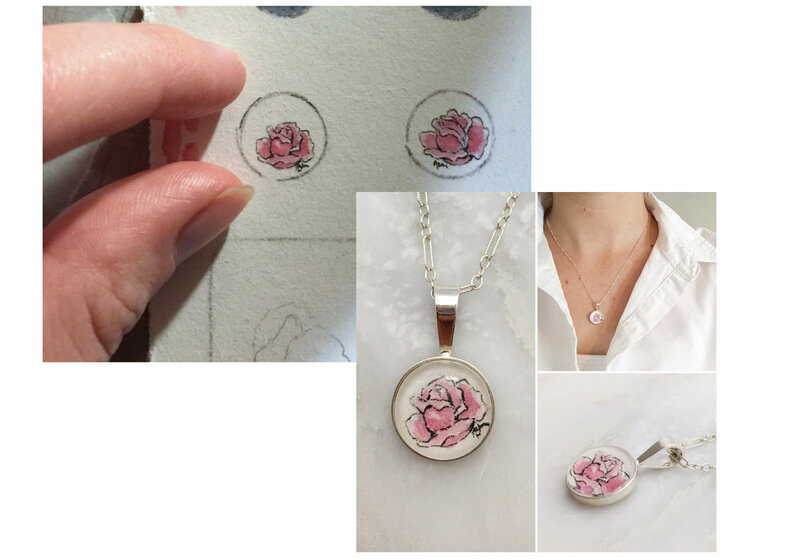 I pay careful attention to each tiny watercolor painting, from the painting techniques to the process of carefully adhering the glass to the finished painting. All of the Jewelry you see on this site is a hand painted, one-of-a-kind piece of artwork! I do not make prints of my work. Each one is the original painting placed under glass and then made into a necklace, bracelet, or pair of earrings! Whenthe resin is mostly dry, I have a small window of time to cut out the piece from the paper and excess resin. I then let the piece finish drying for a few hours before adhering to the Sterling Silver pendant or earring bails.